The first of two vulture themed sets for 1975, Attack at Vulture Falls (7420) is a favorite with fans because of it's nice combination of new and reissued items. 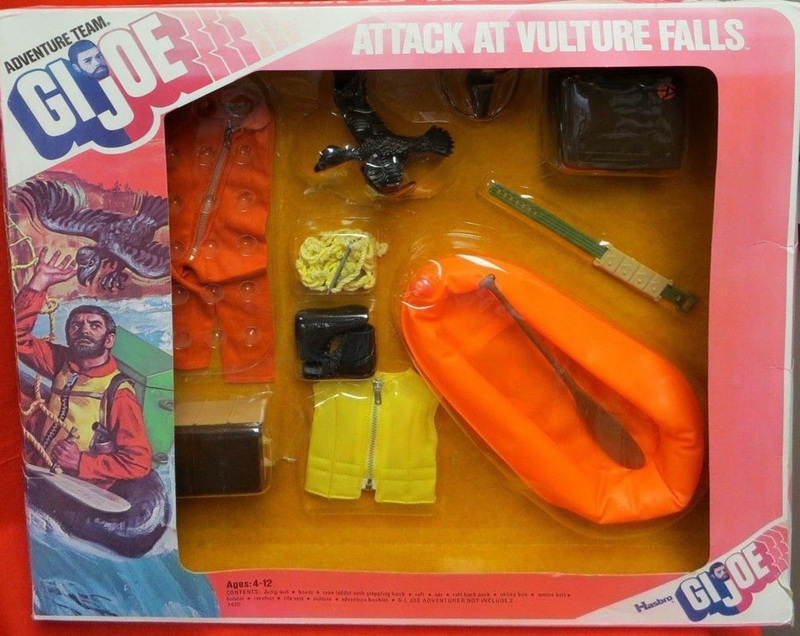 Among the reissues are vulture itself, a neat brown version of the Rescue Raft pack with a hard to find brown two-piece oar, and a tan and brown cargo chest unique to this set. The new accessory is a cool zipper front yellow plastic life vest that looks great on Joe. Other items include a grappling hook and rope ladder, a brown holster and black pistol and the always elusive late issue plastic cartridge belt. These are found with both tan and green cartridge packs, both of which are shown in the spins. Only one actually came with the package. An orange lightweight polyester jumpsuit and low detail black boots rounded out the set. Image of the hard to find box courtesy of Joezeta. Be sure to check out his great sales here!